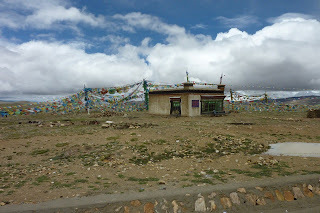 We drove away from Tibet's Everest Base Camp along the old road through the plateau back to the steep switchbacks leading to the Friendship Highway. 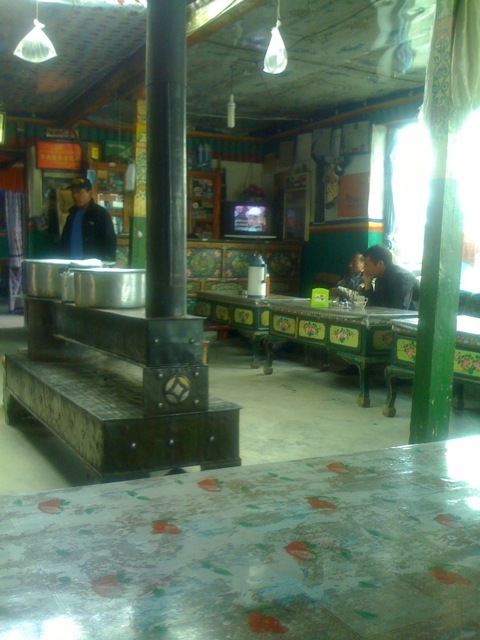 Once there, we pulled up to a rural roadside restaurant for some noodle-and-vegetable soup. Which is where I realized I had a small key in my pocket. The key to the padlock on the door back at the Rangphu Monastery Guesthouse. I left it with the restaurant staff, with instructions to hand it off to the next group heading in the other direction. I hope the key found its way home. I sat alone until some Indian-American tourists struck up a conversation. They were traveling with their families, but had left Everest early when one of them had gotten altitude-sick. They now waited for the rest of their group. But one of their group had gotten seriously ill and was in a hospital back in Lhasa. They were scheduled to depart for Nepal tomorrow but were on a group visa. 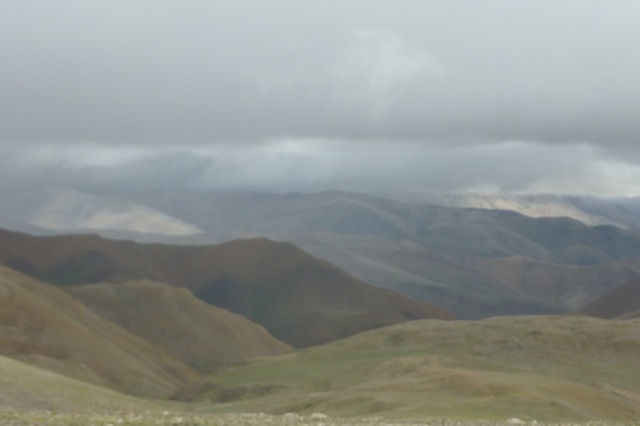 And now I understood the perils of traveling on a group visa to Tibet. You must all leave together, which doesn't allow for emergencies or changes-of-plans. The television in the corner was piping in a slapstick Chinese program, which I ignored until I heard Timbuk 3 on the soundtrack. Surely unlicensed. Wow. Is that success, to be pirated 25 years later as the soundtrack for a comedy show in China? I sublet from that band in Austin in 1986, which is why I had been paying such close attention to their successful LP that I could identify Future's So Bright from a few bars of quirky harmonica in rural Tibet. On we went, until we began to descend down the mountains. The road had only been finished a few years ago and was in constant peril of landslides as it snaked down a huge mountain full of waterfalls straight from Himalayan foothill ice melt. My driver pulled up under one of the waterfalls. "Free carwash," explained the guide. 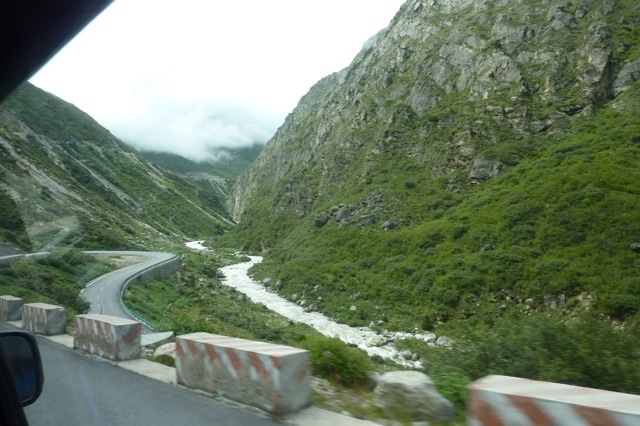 We wound around and around to the scruffy border town of Mos Eis—no, wait, Zhangmu. 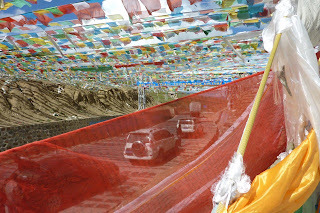 Getting in was tricky as the entire two-lane road was a giant parking lot for colorful Nepalese, Indian, and Chinese trucks. Only one lane was active, since the other was parking, and the one lane had vehicles going in both directions. And the trucks were a lot bigger than us. In time, we found our way down the hill, threading through the onslaught of commerce, and approached a hotel. Which sucked, so I asked for another. The next one didn't allow foreigners and the final one really sucked. "Let's see Mandala," I said. That was a new hotel behind a temple that we'd driven past as I said "How about that" and was ignored. But now they grumpily let me check it out. Mandala was more than decent, so we checked in and said our good-byes for the night. We were all sick of each other. I went across the street to the internet café for my final lesson in how incredibly frustrating China's internet-censorship policies are. I was looking forward to Kathmandu tomorrow night. And while walking back across the street to my hotel, a man smacked my left breast. I stopped, more surprised than pissed off. And there he was, smiling back at me as he walked away. "PERVERT," I yelled at him. "THAT'S DISGUSTING. YOU SHOULDN'T DO THAT. YOU'RE DISGUSTING." He kept smiling and walked. Some European tourists nearby averted their eyes and studiously avoided me. I don't know if the guy was actually a pervert or had the mental capacity of a 10-year-old. He didn't look real bright. But I do believe in making a ruckus when someone does something unacceptable. I was a little weirded-out by Zhangmu now, but I was still hungry, so I walked down the winding road to a little Tibetan restaurant for some rice and veggies, before going back to sleep. My guide was asleep early too, though that didn't last long as the driver had enough wine with his dinner to snore heartily through the night. And in the morning, we raced down the hill ahead of the pack to Immigration, ten kilometers away. "We're first! We're first!" Rinchin was gloating. When other guides showed up with their clients, he reminded them. "When will Immigration open?" We'd been first for some time, having arrived just after 8. Rinchin shrugged. "It isn't always the same." And then it opened at ten, when a guard slid aside a piece of sheetrock that had been acting as a barrier. We hurried through, leaving photocopies at one desk, then passed some guys who unenthusiastically glanced in my backpack (presumably checking for illegal books, which I had on my Kindle, nyah-nyah), then past a final checkpoint. I handed Rinchin his tip. He'd been a good guide. It wasn't his fault I didn't want a guide or a driver, or to be minded for nine days. We shook hands. 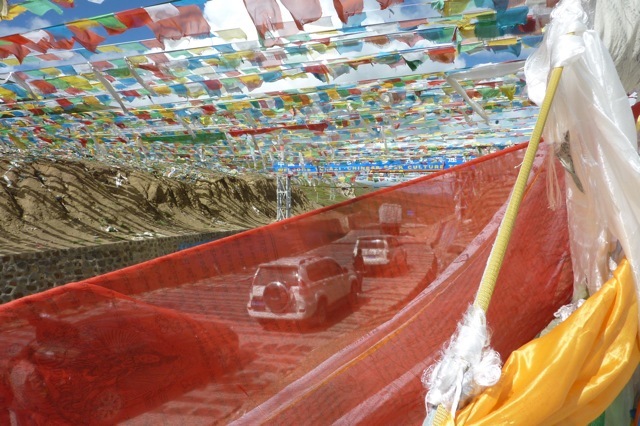 I felt sad for Tibetans and Tibet and the destruction of their culture, but I hadn't actually managed to shake off my supervisors long enough to meet anyone who might speak to me off the record. I could see that the country was developing at the speed of light and that the very culture that attracted the millions of tourists a year was being destroyed by the development, the tourism, and the government of the country sending both. It isn't for me to say whether it's better to have roads or autonomy, or if the former would happen even with the latter, and actually, no one can know what would have happened here had things gone differently before I was born, in 1959. What is clear to me is that the past was wholly misguided, and that there really should be a vote on the whole situation, by people who live there. But the world is too busy with bigger, more violent occupations and disagreements, and no one really has the nerve or manpower to take on China at the UN. Conventional wisdom is that the only hope this little country has is for a bubble-bursting economic implosion in the bigger country. And all bubbles do burst. The Chinese backpacker, new to the scene and roaming the backroads of Asia. These kids are learning about the bigger world. And they are China's future. 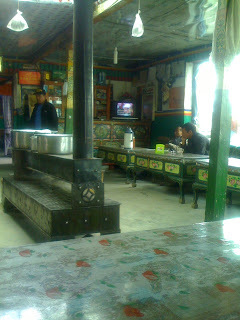 They are meeting Tibetans, learning about the problems in the region, and quite interested in the local culture. I have no proof, no anecdotes, and certainly no data. But these kids are charming as hell, bright, and open-minded. Perhaps they will, in the future, solve what seems to be an unsolvable problem. And with that thought and with Rinchin waving me on, I shouldered my pack and walked out into the rain, across the bridge into Nepal.